Coronado Sets Out to the North, by Frederic Remington, 1861-1909. Francisco Vásquez de Coronado (ca. 1510 – September 22, 1554) was a Spanish conquistador and Governor of New Galicia, Mexico who between 1540-1542 visited New Mexico and other parts of the southwest of what is now the United States. He was born in Salamanca, Spain and went to the Americas in 1535, when he was 25. His first appointment was as and assistant to the Viceroy of New Spain, Antonio de Mendoza. He became Governor of New Galicia in 1538. His motive for his expeditions into New Mexico was to locate fabled 'golden cities'. Although he failed to find treasure, his journeys helped to expand Spanish rule over huge tracts of North America. He and his companions were the first Europeans to view the Grand Canyon. In 1544, after his return to New Galicia, he was tried for and found guilty of cruelty towards his Amer-Indian subjects. He was transferred to a junior post in Mexico City. It is interesting to speculate whether, had he found great wealth, he may have been dealt with differently. Many colonial officials mistreated the American Indians without reproach. Coronado's life was lived within the orbit of Spanish conquest of the Americas, which was almost entirely motivated by the desire to accumulate wealth. Concern for the welfare of the indigenous peoples was limited to the belief that they needed to become Christian. Their culture, beliefs, traditions were of little interest to the majority of the conquistadors. Coronado was thus, in many respects, neither better nor worse than his peers. Coronado's expeditions across the Great Plains in futile search of the mythic golden cities of Cibola, however, opened up new territories for settlement. Much of this territory is now within the United States, thus Coronado is considered to have contributed to the topography of the USA. His journey remains one of the most famous ever made in search of treasure during the Spanish conquest of the Americas. Coronado was governor of Nueva Galicia (New Galicia, contemporary Sinaloa and Nayarit, Mexico). As such he had already sent out Friar Marcos de Niza and Narváez expedition survivor Estevanico on a voyage to the north, to New Mexico. When Marcos returned he told about a wealthy, golden city, called Cíbola. He also reported that he traversed the length of the trail, that Estevanico was killed by the Zuni citizens of Cíbola, and though he did not enter the city of Cíbola it was while standing on a high hill he able to observe that the city was made of gold and that he could see the Pacific Ocean off to the West. Based on this report the expedition had two components. One component would travel by sea and would carry the majority of the expedition’s supplies. The other component would travel by land along the trail Friar Marcos de Niza traversed. Coronado and Vicroy Antonio de Mendoza invested large sums of private money into the venture, and Mendoz being Coronado's friend and fellow investor appointed him as the commander of an expedition to go and find the seven golden cities and take all of their gold. Coronado set out in 1540, joined by a large expedition of 335 Spanish, 1,300 Mexican Indian allies, four Franciscan monks (the most notable of which was Juan de Padilla and the newly appointed provincial superior of the Franciscan order in the New World, Marcos de Niza), and several slaves, both native Americans and Africans. He followed the Sonoran coast northward, keeping the Sea of Cortez to his left. At the last Spanish settlement of San Miguel de Culiacán he rested his expedition before they traveled over the inland trail. Scouts were sent on the trail to investigate the question; "would the land along the route be able to support a large body of soldiers and animals?" The report was that it could not, so Coronado had to divide his expedition into small groups and time their departures so that grazing lands and waterholes along the trail could recover. At intervals along the trail camps were established and garrisoned with soldiers to keep the main supply route open. Once the scouting and planning was done Coronado lead the first group of soldiers on the trail. They were horsemen and foot soldiers who were supposed to travel fast and light, while the main bulk of the expedition would arrive in timed intervals behind them. After leaving the last Spanish settlement they traveled northward through Sonora, and crossed the Gila River, Mogollon Rim, Little Colorado River, and followed the Zuni River drainage into Cibola, in the west of present-day New Mexico. There he was met by disappointment. Cibola was nothing like the great golden city fray Marcos had described, it was just regional complex of simple pueblos of the Zuni Indians. The soldiers openly contemplated killing Marcos and Coronado had to send him back to Mexico in disgrace. Coronado traversed Arizona's Mogollon Rim and from the head waters of the Little Colorado he traveled until he came to the Zuni River. He followed that river until he encountered the region inhabited by the Zunis. The members of the expedition were on the verge of starvation and demanded entrance into the village of Hawikuh, and they were denied entrance or trade. Coronado had to enter Hawikuh through force of arms and take the food he needed. The other villages then did not contest Coronado's demands when the Spanish explored them for intelligence and resources, and this consitutes the conquest of Cibola. In the Hawikuh fight Coronado was injured and he had to stay in the Zuni recuperating. From the intelligence gathered he sent out various scouting expeditions. 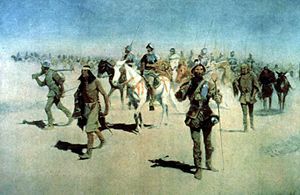 The first scouting expedition lead by Pedro de Tovar was dispatched to the Hopi villages with the expectation that maybe this region may contain the wealthy Cibola. Upon arrival the Spanish were denied entrance to the first village they came across, and they had to use armed force to gain entrance, and afterwards the remaining villages did not contest the Spanish. Materially the Hopi region was just as poor as Zuni, but what the Spanish learned was that a large river (the Colorado), lay to the west. The scouting party returned to Zuni and reported their findings, and Coronado sent another scouting expedition lead by Garcia Lopez de Cardenas to find this river. The second scouting expedition returned to Hopi to acquired scouts and supplies that would be used to find this river. This expedition did find the Grand Canyon and the Colorado River, and they became the first European to see the magnificent Grand Canyon. After failing at trying to climb down into the Grand Canyon to the river they reported that they would not be able to use the river to link up with their ships. After this the main body of the expedition began its journey to the next population center of pueblos which were located along the Rio Grande River in New Mexico. Melchior Díaz was the local commander of a camp along the main supply route. When Coronado was not able to establish contact with the ships from the Zuni region, Díaz was detailed to establish contact with Hernando de Alarcón whose fleet was shipping supplies for Coronado. Díaz set out from the valley of Corazones in Sonora and traveled overland in a north and northwesterly direction until he arrived at both junctions of the Colorado river and Gila river. There the local natives told him that Alarcón's sailors had buried supplies and left a note in a bottle. The supplies were retrieved and the note read that they rowed up the river as far as they could go looking for the Coronado expedition but had given up their wait because worms were eating holes in the ships and that the fleet would return to their departure point. Díaz died on the return trip. Hernando de Alvarado was sent east, and found villages around the Rio Grande. Coronado set up his winter quarters in one of them, Tiguex, across the river from present-day Bernalillo near Albuquerque, New Mexico. In the winter of 1540-41 the demands of his army resulted in conflicts with the Rio Grande Indians that led to the brutal Tiguex War, resulting in the destruction of the Tiguex pueblos and the death of hundreds of Indians. A native, whom Coronado called the Turk, had told him about Quivira, a rich country in the northeast. Deciding to look for Quivira, he took the Turk as his guide and traversed the Llano Estacado and what is now the Texas Panhandle. However, the Turk was found lying about the route—or at least Coronado supposed he was—and was strangled. Other guides led him further to Quivira, and he reached a village near present-day Lindsborg, Kansas. But his disappointment was repeated: the Quivira Indians (later known as Wichita) were no rich people at all, the village consisted mostly of thatched huts, and not even small amounts of gold could be found. Coronado returned to Tiguex, where his main force had remained behind. Here he spent another winter. Near present day Dodge City, Kansas, Coronado held the first Christian Mass in the interior of North America which is presently marked by a large concrete cross called Coronado's Cross to commemorate the event which took place on June 29, 1541. In 1542 Coronado was ordered back to Mexico so that his troops could help put down the The Mixtón Rebellion. He left behind two Franciscan missionaries, who insisted that they stay and withdraw his forces back to Mexico by roughly the same route he had come. When he arrived back in Mexico the Mixtón Rebellion was already over. Only 100 of his men came back with him. Although the expedition was a complete failure, he remained governor of New Galicia until 1544, but the expedition had bankrupted him. In 1544, found guilty of mistreating his indigenous subjects, he was transferred to a minor post in Mexico City, where he died in 1554. In 1547 he regained some favor when he testified on behalf of the Governor of New Spain, Antonio de Mendoza and in 1549 he was rewarded with a grant of land. The opening up of communication between Mexico and what later became New Mexico and Colorado, and their eventual incorporation into the United States is a direct consequence of Coronado's expeditions. There is a large hill near Lindsborg that is called Coronado Heights. The former owner of the land built a small castle at the lofty summit to commemorate him. The castle and the area around it is now a public camping and recreation area. The soft sandstone rocks at the peak of the hill are covered in the names of past visitors to the area. In 1952, the United States established Coronado National Memorial near Sierra Vista, Arizona to commemorate his expedition. Francisco Vasquez de Coronado Retrieved February 13, 2008. History of "Francisco Vásquez de Coronado"
This page was last modified on 25 April 2017, at 14:48.